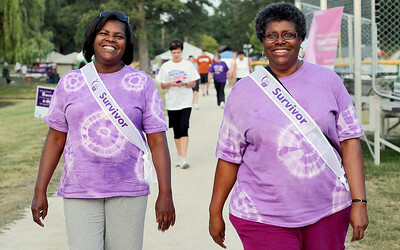 Sarah Nader - snader@shawmedia.com Cancer survivors Annette Berry (left) of Schaumburg and Rhonda Taylor of Hanover Park walk around the track while attending Relay for Life in Huntley on Friday, June 15, 2012. 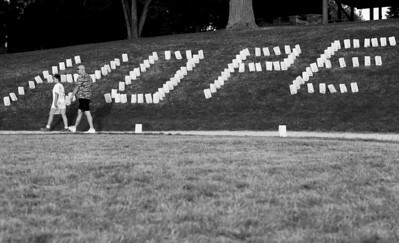 Relay for Life raises money for cancer research and cancer patients while helping spread cancer awareness, celebrate survivors and remember those who lost their lives to cancer. Sarah Nader - snader@shawmedia.com Participants walk around the track while attending Relay for Life in Huntley on Friday, June 15, 2012. Relay for Life raises money for cancer research and cancer patients while helping spread cancer awareness, celebrate survivors and remember those who lost their lives to cancer. 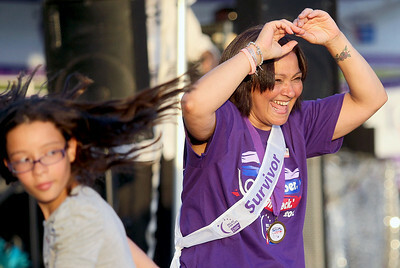 Sarah Nader - snader@shawmedia.com Cancer survivor Flora DeKoster (right) of Lake in the Hills dances to the music while attending Relay for Life in Huntley on Friday, June 15, 2012. Relay for Life raises money for cancer research and cancer patients while helping spread cancer awareness, celebrate survivors and remember those who lost their lives to cancer. Participants walk around the track while attending Relay for Life in Huntley on Friday, June 15, 2012. Relay for Life raises money for cancer research and cancer patients while helping spread cancer awareness, celebrate survivors and remember those who lost their lives to cancer.